Your place in Paradise! Beach, pool, plus diving and truck rental discounts! Read our reviews, they say it better than we can. Lighthouse Beach Resort #13 / Kas Bientu di Pasat is a spacious 2 bedroom (air-conditioned), 2-1/2 bath townhouse located in a ocean side community with pool and a private dive site beach. Ideal for divers, snorkelers, windsurfers, kitesurfers and families. Let our home be your vacation home in the paradise that is Bonaire. .
We are just steps from world class diving, and minutes from windsurfing, kitesurfing, town, shopping, sightseeing, casinos, and excellent restaurants. Fully equipped home with a private tropical yard, private community pool and beach. 100 yards from beach and Lighthouse Point dive site. Numerous world-class diving sites are located close to this prime location. One of the closest rental villas to Lac Bay, which boosts world-class windsurfing as well as rentals and instruction for beginners to experts, Kite Beach at Atlantis and all the southern dive sites. Everything you need for a fun vacation and much more is included in our rate. Amenities include free local phone and free US/Canada phone, private high speed Wi-fi and wired internet connection, air conditioning in bedrooms, cable, HDTV with DVD library and Chromecast. A full size and fully equipped kitchen with microwave, refrigerator, coffee maker, blender, cooking utensils, plates, etc. all provided. Your own full size gas grill (BBQ) for easy outdoor cooking. Outdoor shower and gear rinse sink with outdoor and indoor gear drying areas. 10% diving and 20% vehicle rental discounts are available to our confirmed guests. The kitchen was just remodeled in February 2017 with new cabinets and granite counter tops and we installed new air conditioners in the bedrooms. The best gets even better. Beds for four (queen plus two single beds) plusa roll-away bed for a fifth person. There is an air mattress for a possible sixth person if you want to squeeze but please discuss this with us before booking. All towels and linens provided and replaced weekly during multi-week stays. Base price is for up to two guests and does not include Bonaire Tourist Tax of $5.50 per person, per night or cleaning fee. Additional guests are $17.50 per person, per night, which includes the Bonaire Tourist Tax. Stan dives and does a little windsurfing. Audrey snorkels and just retired so she can spend more time on Bonaire. 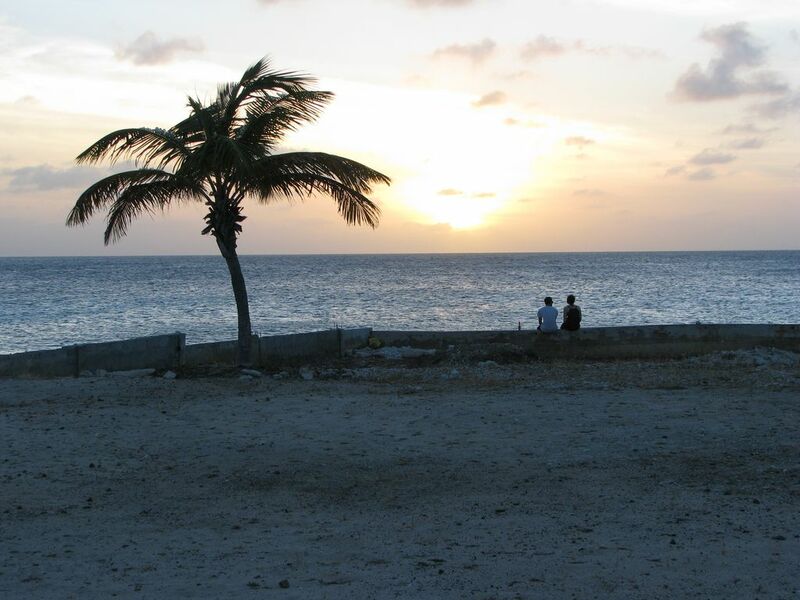 We first visited Bonaire almost 25 years ago, staying at the old Sunset Beach Hotel. We loved the place, the nicest people, the diving, everything about it. We gave thought to buying something but there really wasn't much for sale back then, and with a young daughter we decided that it just wouldn't work for us at the time. Fast forward 20 years. Our friends, Mike and Craig, retired and started spending good parts of the winter in Bonaire, leaving their wives home to work (their wives choice!) Mike was either windsurfing or waiting for the wind and Craig diving every day and sneaking in some windsurfing. They were renting at various places, including Lighthouse Beach. We started coming down with their wives, Shelley and Karen (respectively) to visit in February, first staying at Coco Palm Gardens and then with all of them when they bought their place at Kings Beach Resort. Always a wonderful time, Craig and I diving every day, the ladies on the beach at Lac Bay while Mike was windsurfing. Cocktail hour on the beach every night followed by a great dinner, the result of either group cooking at home or at one of the many great restaurants like Wil's, Mi Banana or the old Cactus Blue. One year, while Audrey was hanging out with Shelley, Karen, and some of their friends, someone mentioned this really nice place for sale next door so Audrey said we should go see it. I had no interest in buying anything but went along with it because that's how you stay married for 40 years. :-) LBR #13 was just such a great place that we came away thinking that maybe this was the time to fulfill that 25 year old dream. So, we took the figurative 'giant stride' into the deep water and here we are the owners of this beautiful home. We aren't right on the water but just walk out the back to the pool and the beach. You can see the ocean from the bedroom window, but it would be misleading to call it "ocean view"
Free phone calls to/from the US and Canada with our US based VoIP phone. Free local phone line for those restaurant and dive boat reservations. All linens and towels are provided. For longer stays, our property manager will provide clean linens and towels every week and take your used ones to be cleaned. We have a dedicated, secured, internet connection. Wired and wi-fi. All linens and towels are provided, including beach towels. For longer stays, our property manager will provide clean linens and towels every week and take your used ones to be cleaned. Full size refrigerator/freezer. Plenty of room for food and lots of ice. Cuisinart 12 cup with thermal carafe to keep your coffee hot all morning . A spare is available because we all need our coffee! No guarantees but usually oil, vinegar, basic spices, etc. Everyone uses what they need and replaces what runs out. Everything you need for serving all your meals. As fully equipped as your kitchen at home. Full size stove and refrigerator make shopping and cooking easy. Table for 4 and eating at counter for 4. Table for 4 on patio. plus extra chairs. A CD stereo "boom box" with USB input to play music from your device. Almost 100 current titles in our DVD library. Our private garden back yard with chaise lounges and sail shade. Screened in patio area with dining table. Tree shaded yard with chaise lounges. Guests receive a 10% discount on air/nitrox and training at Dive Friends Bonaire. The first floor is accessible but the bedrooms are on the second floor and are not wheelchair accessible. Sorry, we do not recommend our home for guests needing a wheelchair. Private resort beach, Utility/Gear drying room off kitchen, Freshwater Outdoor Shower, Tropical Setting Backyard & much more. Stef, our property manager lives right next door in case you need any help. Practical, compact and a great source of comfort.to call home for a couple of weeks. Our 4th visit and the best rental. I accompany my older son who learnt to scuba on this island. I snorkel and swim, and do photography so the location is ideal for me to amuse myself while he is enjoying his sport. And being a senior the proximity to the ocean is convenient and close to come back to lounge in your lovely shaded back yard and listen to the birds chirping and the visit of an iguana occasionally. The kitchen was stocked with most of the basic items. But we did miss a carrot peeler, and a heavy bottomed pan in which to brown meat for the making of pastas, etc. We tend to be 'back to basics' cooks. Other than that we made great use of the good quality barbecue provided and a delight to use compared to the normal provided with a rental unit. Having air conditioning in each bedroom made for a great nights sleep as outside temperatures do not fluctuate much between night/day. It was great to know that we had your neighbor Stef to call upon if needed; otherwise she leaves you to enjoy your holiday. Definitely looking forward to our vacation at your home in 2020!! Probably the best equipped rental we have ever stayed in. There was a well stocked kitchen, plenty of towels, rinse buckets and hangers for dive gear, ample games, movies, and books - not that that we had time for them this trip. We appreciated having the Shore Diving Made Easy and the Humann/Deloach ID books available. I especially loved the screens since I am a mosquito magnet. The new Dive Friends location at Del Fins was super convenient - our only complaint would be that their rinse tanks were empty in the evenings we checked so we couldn't use them. We generally prefer to use the dive shop's since it is quicker for us to rinse our gear, but the rinse tub outside the rental was convenient we just couldn't fit in as much gear at once. We would stay here again. Thank you so much for taking the time to write such a kind review. We are delighted that you enjoyed your stay. The dive shop at Delfins closes at 5 which is why you weren’t able to use their rinse sinks after that time. I am glad, however, that you did use the rinse sink on our property. Love love love this condo! Exceeded every need! Already booked our next stay for same place next year! Thank you so much for your wonderful note. We are thrilled to be able to welcome you back next year! Well appointed and felt like home! Nice quiet area in between all of the places we wanted to visit. The place had all of the items we needed for cooking, relaxing and enjoying our stay. They were very responsive to any questions and made us feel welcome before we even arrived. Thank you for opening your home to us. Thank you so much for taking the time to write a review for your stay at our home. It would be our pleasure to welcome you back for another stay. Enjoy the rest of your summer. Very Nice. Just what we needed. It was very nice. A little to warm when air wasn’t on. I guess we’re not used to the heat along with humidity. The home had everything we needed and all the dive equipment, dive sink, hangers, etc were great. The home was well stocked with all our needs. We thoroughly enjoyed our stay. Thank you so much for taking the time to write about your experience at LBR 13. It can be pretty warm this time of year, but I hope the beautiful ocean water and our pool helped to keep you comfortable. We hope to welcome you back on another trip to Bonaire. Great location. Close to windsurfing, diving, grocery shopping, and restaurants. We arrived late in the day and found a welcome basket with snacks. The kitchen was well-equipped and we enjoyed making dinners at home and enjoying them on the porch. The bbq was great for grilling. The bedrooms were spacious and had great A/C. Wonderful place to spend our vacation. Thank you so much for taking the time to let us know that you enjoyed your stay at LBR 13. It's important to us that our guests have the best possible experience, so we are happy to receive your feedback. Best wishes for a wonderful New Year, and we hope to welcome you back to our home soon. Kitesurfing is up and coming nearby at the sourthern tip of Bonaire. Local Festivals and Crafts. Animal lovers should visit the nearby Donkey Sanctuary. Tour Washington Slagbaai National Park on the north end of Bonaire. Our guests receive a 10% discount on diving and a 20% discount on car/truck rentals. Details and discount vouchers provided prior to your arrival. Check-in is generally at 4 PM and checkout is at 9 AM. If there are no guests departing or arriving on the same day, we may be able to change these times for your convenience. See rental agreement for details on cancellation policy.